Serpentine is the California State Rock. The effluent of toxic mud volcanos might seem a strange choice for a state rock, but the related higher grade blue and greenschist metamorphism has produced eerily beautiful rocks with sinuous veining from which the name probably derives. A mud volcano emerged as a small island off the coast of Pakistan last month after the recent earthquake there. The beautiful stones worthy of state rocks are found as clasts entrained in a slurry of highly pressurized hot water and mud formed many tens of kilometers below the surface. Photo credit Terry Wright. 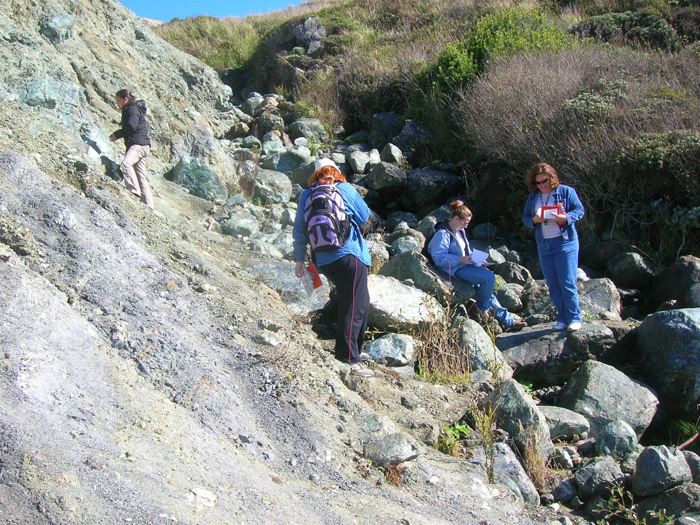 These women are exploring greenschist clasts in a serpentine mud matrix. The “purple dirt” and the serpentine coloration of the clasts derives from chromium and cobalt. One can find serpentine soils in California by simply gazing for “serpentine barrens” in the hills. The high levels of nickel, cobalt, and chromium and the deficiency of potassium and phosphorus and an unfavorable calcium/magnesium balance make serpentine soils inhospitable to all but grasses and a few specialized flowering plants. 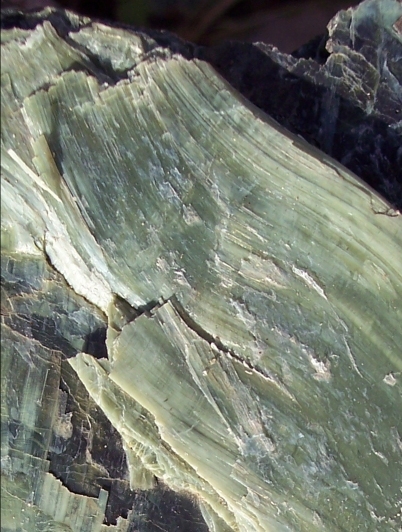 Due to its high pressure hydration and disorganized chemical structure, serpentine is much lighter than the ocean floor basalts from which it is made. Before there was granite and before there were continents there was probably serpentine, bubbling up through fractures at young, hot subduction zones to create land like shallow provinces too buoyant to be forced back into the mantle. Let’s call it primordial subduction. Serpentine causes magnetic anomalies and can foul up compass readings. Its formation is known to create abiotic methane in the high pressure but relatively low temperature conditions as water is squeezed out of descending hydrated ocean floor at subduction zones. Thomas Gold believed that much of the hydrocarbons we live by were produced by microbes from mineral methane. With this bag of tricks it is rather like the serpent after all. This entry was posted in Geology, Plate Tectonics, Serpentine and tagged Earthquake, Mud volcano, Subduction. Bookmark the permalink.